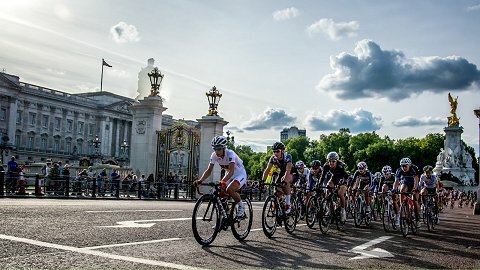 In a Â race where the British domestic based riders were in many of the attacks, in the end, it was the international riders who dominated the result. 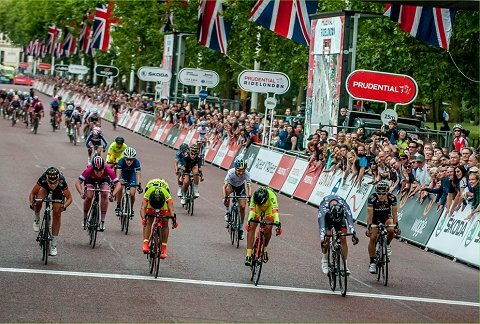 Led out by Trixi Worrack, Guarischi timed her effort to perfection to pip Shelley Olds on the line after three-quarters of an hour of helter-skelter cycling around St Jamesâ€™s Park, with Oldsâ€™s Ale Cipolinni team-mate Annalisa Cucinotta taking third barely a wheelâ€™s rim behind. Guarischiâ€™s team leader Lisa Brennauer had made a break with five of the 15 1.3-mile circuits to go, and when the world time trial champion was reeled in the Velocio squad reorganised at the front of the peloton to get Guarischi into prime position. The Italian has been in fine form recently, winning a stage at the Giro dâ€™Italia Femminile, and she launched herself at the line alongside her Cipolinni rivals before throwing her right arm up in triumph and screaming at the London sky, full of joy at a job done well. â€œI canâ€™t believe it, I really canâ€™t believe it,â€ said the 25-year-old. â€œThis is all down to teamwork; together we can do anything. All season we have worked together and we have won a lot. â€œToday was a good race for us; a great race for me. 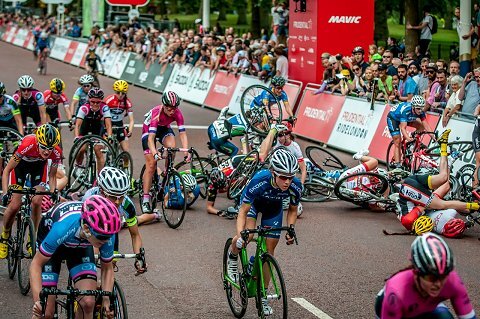 Our tactic was to go all out for me to win the sprint. But it was not easy because there were a lot of strong riders in the race and it was hard to compete. â€œIt was such an aggressive race and we only had four, so it was tough against the bigger teams,â€ said Olds. â€œWe had to be careful we didnâ€™t let anything go and we wanted to be up for the sprint too, so it was hard work. Cucinotta led briefly as the sprinters began to wind-up for their final efforts, only to be overhauled when Guarischi sprung from the Velocio trap. â€œI started early in the sprint but Barbara was very strong and that was kaput,â€ she said. â€œThis win was really important for me,â€ she said. â€œI was a bit tired when I arrived in London but with this team itâ€™s impossible not to race well. Of the other British riders, Abby Mae Parkinson, Lucy Martin, Dani King, Lydia Boylan, Molly Weaver,Â LucyÂ Chittenden and Jo Tindley were just some of those seen attacking during the race where a move by Dani King, Lucy Martin andÂ LucyÂ Chittenden at the end almost stayed away for the victory. National road and track champion Ella Barnwell added a third title to her growing list of honours when she led Sophie Williams to a Welsh one-two in the girlsâ€™ race ahead of Elizabeth Catlow of the East Midlands. Jake Stewart grabbed an impressive win in the boysâ€™ race, the West Midlands rider covering early attacks before sprinting across the line ahead of Central regionâ€™s Charles Page, with Jim Brown of Yorkshire third. â€œI knew it was a quick circuit so I was hoping to win,â€ said Stewart, who finished second in the recent British Championships. â€œI chased down a few breaks early on then it was just the top five riders for the last two laps.